Jaguar Land Rover has been working with WMG to sponsor a doctoral candidate, Limhi Sommerville, on a project to improve automotive batteries. Find out more about how the partnership works. What is the focus of Limhi’s research? 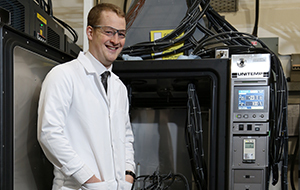 Limhi’s project looks at improving how long a battery lasts in automotive applications. His focus is on understanding why and how batteries age and fail, and putting together a procedure that will allow Jaguar Land Rover to improve cell lifetime on future products. How will the project be of benefit to Jaguar Land Rover? Battery technology could be vital for the automotive industry in the future. An automotive battery has to last for a lifetime or the lifetime of that vehicle, and Limhi’s research will help Jaguar Land Rover to target variables that attack the battery’s longevity, such as temperature and vibration. Limhi is using modelling during his project, allowing him to simulate life cycles of the battery in the vehicle and see how things will change over time. Jaguar Land Rover can use Limhi’s findings to advise on what tolerances the battery can be put under much earlier in the process, before designing and manufacturing the hardware, which will save time and reduce costs. 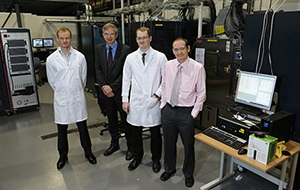 Limhi has three supervisors for his project: Professor Paul Jennings and Dr Andrew McGordon of WMG, who make sure he is satisfying all of the academic requirements to obtain his doctorate, and Chris Lyness, Technical Specialist for Batteries at Jaguar Land Rover, who ensures that the work Limhi is doing has the maximum impact in his business. Limhi is in constant contact with Jaguar Land Rover during his project and the feedback and sharing of information is two-way, meaning that Limhi can quickly understand if a line of enquiry is important for the business and worth pursuing further. “What we’re doing here is pushing the boundaries of engineering in the UK. We’re also starting to grasp fundamental things that are pretty unique within the industry. Because of this unique collaboration we have here, we can look into areas that we wouldn’t normally look at in an engineering environment.